I just caught a sniff of Sarah Jessica Parker's new fragrance trio, that has just arrived to Shoppers Drug Mart in Canada. The three fragrances are called Dawn, Twilight and Endless - and each is said to be inspired by lovely moments in SJP's life. After the disappointment of Covet (original, but not something I would want to wear) and Covet Pure Bloom (which smells too much like others) I have to say I was surprisingly impressed with this collection, and with Twilight in particular. Dawn smells like freshly cleaned and dried laundry. I still am not sure if it smells like the laundry detergent or dryer sheets or both. Twilight is a sheer amber, and very similar to Ambre Fetiche (Annick Goutal) and in a way is what one might have hoped to get out of the solid perfume of Stella in 2 Amber. Endless was a nice and a fruity floral on the more interesting side. It was crips rather than sweet. All three deserve a skin test, and I am hoping to do this very soon and post more thorough impression of their evolution on my skin. SJP is running a survey to help with the development of yet another new scent. This new perfume will be packaged as a fashion accessory and is supposed to represent Sarah Jessica's unique fashion style as well as her funky NYC context. It's a really fun survey and I hope that those filling it are going to ask for something new, surprising and original (I certainly did). So if you are into a new, original and surprising scent from SJP than please contribute your opinion by answering the survey questions. If you are into more fruity florals from celebrities please don't answer it at all, as I'm sure you will get a lot more of those on the shelf without ever asking! Yet, somehow, Carrie feels that she (or perhaps it is her imaginary friend, whom she often refers to as "Sarah Jessica Parker") are completely innocent, even after she was clearly documented and caught red-handed in the process of stealing her friend's perfume from a shop at the Place Vandome. If you too feel that Carrie (she now claims to be an innocent American in Paris and goes by the above name of the imaginary friend who's name is all over the perfume bottle she attempted to steal) - than you are encouraged to help her out of jail via this website. Perhaps a little of "behind the scenes" will help you solve the crime? 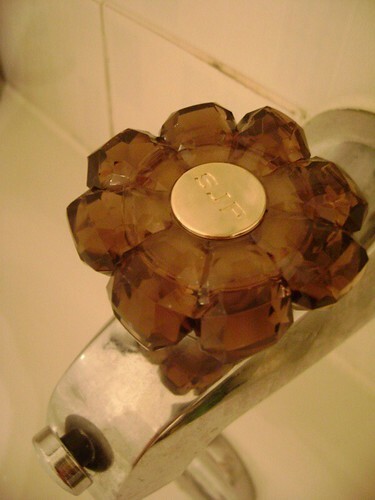 Covet Faucet, originally uploaded by Ayala Moriel. Apparently, Carrie Bradshaw is not so much into writing her column anymore - she is now selling gold-initialed faucets in downtown Manhattan.